The spring exhibitions in the Galleries at Herron School of Art and Design open March 7, 2018, headlined by a survey of works by kinetic artist Zilvinas Kempinas, including the international debut of a new, 112-foot-long site-responsive work. Using VHS magnetic tape and other unconventional materials, Kempinas crafts dynamic sculptures and installations that are activated by natural phenomena such as light and the circulation of air. Among eleven works in the exhibition are eight new sculptures on view for the first time, including "V Formation," a large-scale installation conceived for Herron's main gallery space. "V Formation" (2018) incorporates lines of unspooled VHS tape stretched across the length of the gallery. The installation creates a low 'ceiling' of shimmering reflective tape just above visitors' heads. 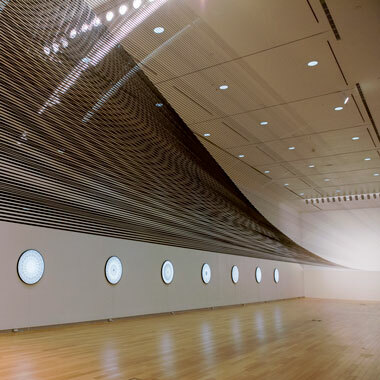 As the bands traverse the 112-foot-long gallery, the tape torques from a horizontal plane to a vertical one. The result is a monumental yet ethereal installation that transforms the experience of Herron's space in unexpected ways. "Zilvinas Kempinas" runs through April 21, 2018, in the Berkshire, Reese, and Paul Galleries. In the Marsh Gallery: Celebrating Herron's Painting program, an undergraduate painting exhibition showcases a variety of works that explore traditional and contemporary methods and practices. In the Basile Gallery: "Drawing Now: Recent Student Artwork" features a selection of work from students in Herron's Drawing and Illustration program. Shannon M. Linker, vice president of the Arts Council of Indianapolis and director of Gallery 924, will serve as guest juror for the exhibition. All three exhibitions open with a public reception on Wednesday, March 7 from 5:30 to 8:30 p.m. at Eskenazi Hall, 735 W. New York St. The student exhibitions run through April 18, 2018. The Galleries at Herron are free and open to the public Monday through Saturday from 10 a.m. to 5 p.m., and Wednesdays until 8 p.m. For more information, visit HerronGalleries.org. Parking is available courtesy of The Great Frame Up Indianapolis in the visitor section of the Sports Complex Garage (west of Herron's Eskenazi Hall), or on the upper floors of the Riverwalk Garage (south of the Sports Complex Garage) until 6 p.m. Park on any floor after 6 p.m. Bring your parking ticket to the Herron galleries for validation. Kempinas was born in Plungė, Lithuania in 1969. In 2009, Kempinas represented Lithuania at the 53rd International Art Exhibition of the Venice Biennale in Italy. He has had solo exhibitions at Ikon Gallery, Birmingham, U.K.; Reykjavik Art Museum, Iceland; Museum Tinguely, Basel, Switzerland; Garage Museum of Contemporary Art, Moscow; Kuntshalle Wien, Vienna, Austria; and the Palais de Tokyo, Paris, among others. Group exhibitions include the Museum of Modern Art, New York; Centre Georges Pompidou, Paris; San Francisco Museum of Modern Art, San Francisco. Kempinas lives and works in New York City.